The Palestinian Question, without exception, incites immense intellectual, political, and artistic activity throughout Arab cultures. The historical pains of the Nakba and the 1967 War are felt not only by Palestine and its diaspora, but shared among all Arabs who remain invested in the cause of the Palestinians. Yet, modern Palestine exists in a unique state that has yet to be fully interpreted by the Arab canon. The occupation of the West Bank and Gaza and the ensuing actions of the Israeli government are modern developments that stand in contrast to older stories focused on the experiences of Palestinian refugees and the continued struggle of the PLO. Native authors like Sahar Khalifeh have written on the early experiences of occupation for Arab audiences, and diasporic authors like Naomi Shihab Nye have written stories set in the occupation for Western audiences, but Emad Burnat’s 5 Broken Cameras exists in a unique category occupied by indigenous Palestinian works aimed at Western audiences, framing the daily experiences of occupation in a documentary suitable for wide consumption. 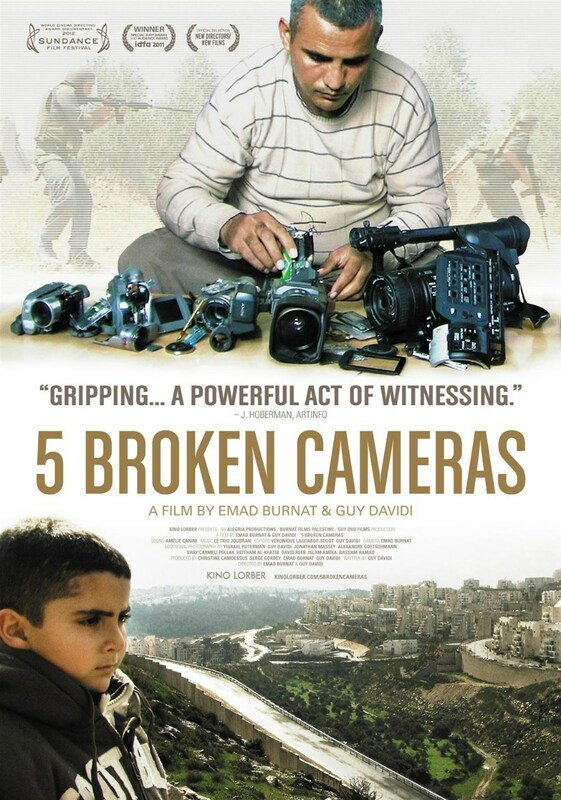 5 Broken Cameras spans five years in the life of Emad Burnat, and his five successive cameras broken at some point or another by Israeli forces in his attempts to film the ongoing demonstrations in his hometown of Bil’in in the West Bank. Part video journalism and part memoir, the through-line of movie is the childhood of his youngest son Gibril, born on the day Israeli settlement began on the olive groves of Bil’in. Gibril’s first words are “partition”, “army”, and “[grenade] cartridge.” By the end of the movie, five-year-old Gibril has participated in a protest against nighttime arrests of children in Bil’in by Israeli forces, and expresses anger at the army for killing his father’s close friend, Phil. The occupation takes an immense toll on Burnat and Bil’in both; deep physical, emotional, and financial costs are incurred over five years of filming, yet Burnat’s camera stays an impartial observer of the events unfolding around him. Burnat depends solely on the events unfolding in front of his camera and his own steady, journalistic narration in order to deliver the emotional impact of the film. Though Burnat himself is a partisan, heavily affected by the events of the occupation and participating in demonstrations himself, he does his best to let his footage make his case for him. It is a wise choice, especially considering how the film appears to be in dialogue with Western assumptions and accusations about Palestine. Burnat shows how a nonviolent (if occasionally ostentatious) group of demonstrators are continually gassed and provoked by Israeli forces, and how, over the course of successive nighttime arrests of children, and the killing of two young locals, the people of Bil’in eventually find it difficult to maintain their nonviolent practices. Burnat also draws attention to double standards enacted by the Israeli legal system, and tries to show the way the costs of occupation are distributed to Palestinians. 5 Broken Cameras is casually tragic yet carefully crafted to get audiences to consider the price of occupation. It shows the struggle of living even in a normal, unsuspecting West Bank village, and it forces Western audiences to reconsider how they might perceive Palestinians. Burnat’s report humanizes a people neglected by an occupying country, an international community, and oftentimes, the indigenous Palestinian Authority. Moreover, it creates a lasting addition to the Arab canon of Palestinian stories; his meditative and emotionally affecting documentation of Arab life is sure to be remembered for years to come.